20 OCTOBER DEMONSTRATION – THIS SATURDAY! Please join us if you want to meet up with others from Camden who are marching. Unison members working for NSL have voted for all out indefinite strike action in their dispute over poverty pay and conditions. Unite members at Amnesty International (uk) have been striking against a cost cutting programme including redundancies. 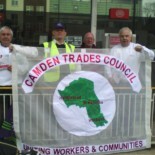 This entry was posted on October 15, 2012 by CAMDEN TRADES COUNCIL.